My latest book is available on Amazon! Also Barnes and Noble! Gold Winner in “Aging Family” and Honorable Mention in “Life Journey” Human Relations Indie Book Awards, 2017. Bronze Winner in “Mature Living/Aging” Living Now Book Awards, 2017. Finalist in “Health: Aging/50+” Best Book Awards, 2017. Finalist in “Death and Dying” National Indie Excellence Awards, 2017. Throughout the years, Lisa and her dad had a tenuous relationship. In her youth, she was disappointed and angered by his behavior, distancing herself from him and blaming him for the sudden end to their intact comfortable family life. As a young adult and after her father’s sudden heart attack, Lisa was given a second chance to heal their relationship. Over the next three decades they became closer, enjoying time together, including travel. When her dad entered his eighties, and while still raising her own children, Lisa found herself unprepared for his steady health decline. Suddenly, she was thrust into the role of overseeing his care as he began to experience increasing disability and the beginnings of dementia. Not having prepared for or anticipated such a role, Lisa floundered as she attempted to address his ever-changing situation. The closeness and healing they had achieved was challenged as her father resisted conversations about his failing health and his care, exacerbated by a western medical system that fell short to prepare them for the end of his life. 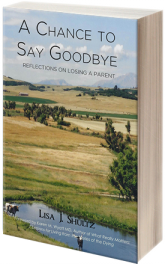 A moving tribute to a remarkable man and a daughter’s experience of losing her dad, A Chance to Say Goodbye gives rise to reflections about what is important in living and dying.